Preparation is key to making the most out of your Rug Doctor carpet cleaning experience, whether you’re using your own Rug Doctor machine or one that you’ve rented. We’ve got 3 easy steps to get your carpets back in top form, follow these steps and you can get the same deep clean as a professional carpet cleaner does at a fraction of the cost. Each machine has Rug Doctor’s unique vibrating brush that gets between each carpet fibre to remove harmful dust, dirt and other irritants from your home. The best way to make sure you can evenly and effectively clean the whole room is to remove all of the furniture first before starting to clean. Only return the furniture when carpets are completely dry. As it isn’t always possible to remove all the furniture, the next best alternative is to move it to the middle of the room . When using the Rug Doctor, you will work from the edge to the middle of the room. You will be cleaning the carpet perimeter first. If you have left the furniture in the room, you will be moving it back into its place and then cleaning the centre of the room. Have a roll of kitchen foil to hand as you will need to put a piece of foil under chair or table legs while the carpet is drying to prevent rust or dye transfer. When moving furniture make sure to follow these tips to make light work of a heavy load. This might sound obvious, but it’s easy to forget that drawers and their contents can often be heavy but they can easily be removed to significantly lighten the load. If you can, try to slip some cardboard under the legs of the furniture and then slide it across your carpets as opposed to lifting to avoid any straining. Once you’ve got all of the furniture out of the way you need to get your carpets as clean as you can in order to remove any surface dirt. The Rug Doctor will work more efficiently removing dust and dirt embedded deep into the carpet fibres if your carpet has been vacuumed. 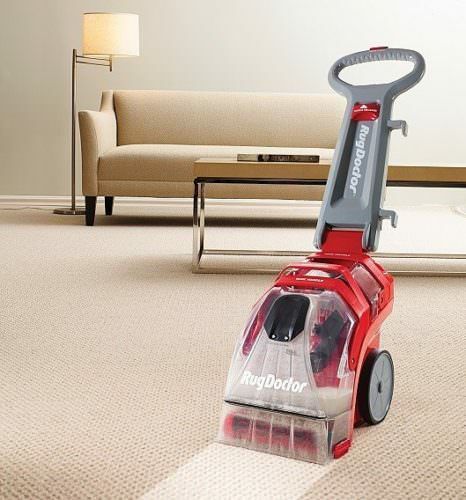 Make sure you vacuum thoroughly passing over the carpet multiple times to remove as much surface dirt as possible. Now your carpets are furniture free and vacuumed it’s time to pre-treat. We’ve got pre-treatments for every carpet problem from our High Foot Traffic Cleaner for those high traffic areas like hallways and kitchen entrances, Odour Remover for neutralising bad odours at source – leaving carpets smelling fresh and deodorised to Urine Eliminator for any pet puddles or nappy overflows. You’ll want to get your hands on your pre-treatment before you rent the Rug Doctor as some pre-treatments need more time to work effectively than others. Follow the instructions on the pre-treatment to use with a Rug Doctor machine. Remember preparation is key to making the most out of your Rug Doctor machine or rental. Once your home is prepped you can get started on deep cleaning to get your carpets feeling and looking clean and fresh again. This entry was posted in Carpet Cleaning, House Prep, Hacks. Bookmark the permalink.